Much has been said and shown about the Spartan army in our popular culture. And while some of them have the historical basis, a few other sides are just instruments of exaggeration. In any case, we should start off with what might seem fantastical but was probably true – and it pertains to how Spartan babies were actually inspected at their birth, with the perceived ‘unworthy’ ones (or at least a few of them) being left in the canyon by the Mount Taygetos. And while the child grew up into boyhood, he was given a diet of frugal food and sometimes bathed in wine (thinned with water). Such contrasting practices were believed to mold both his fortitude and physique as per the requirement of a Spartan warrior. 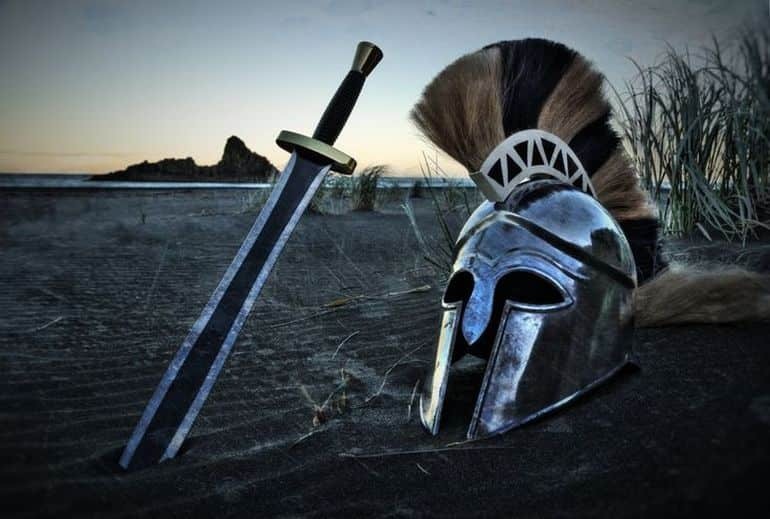 In consideration of these incredible standards, let us take a gander at ten things that you may not have known about the Spartan army. The agoge was the Spartan regimen that combined both education and military training into one rigorous package. As noted by Prof. Nick Secunda, it was mandated for all male Spartans from the age of 6 or 7 when the child grew up to be a boy (paidon). This meant leaving his own house and parents behind and relocating to the barrack to live with other boys. Interestingly, one of the very first things that the boy learned in his new quarters was the pyrriche, a sort of dance that also involved the carrying of arms. This was practiced so as to make the Spartan boy nimble-footed even when maneuvering heavy weapons. Along with such physical moves, the boy was also taught exercises in music, the war songs of Tyrtaios, and the ability to read and write. By the time, the boy grew up to be 12, he was known as the meirakion or youth. Suffice it to say, the rigorous scope was notched up a level with the physical exercises increased in a day. The youth also had to cut his hair short and walk barefooted, while most of his clothes were taken away from him. The Spartans believed that such uncompromising measures made the pre-teen boy tough while enhancing his endurance levels for all climates (in fact, the only bed he was allowed to sleep in the winter was made of reeds that had been plucked personally by the candidate from the River Eurotas valley). Added to this stringent scope, the youth was intentionally fed with less than adequate food so as to stoke his hunger pangs. This encouraged the youth to sometimes steal food; and upon being caught, he was punished – not for stealing the food, but for getting caught. 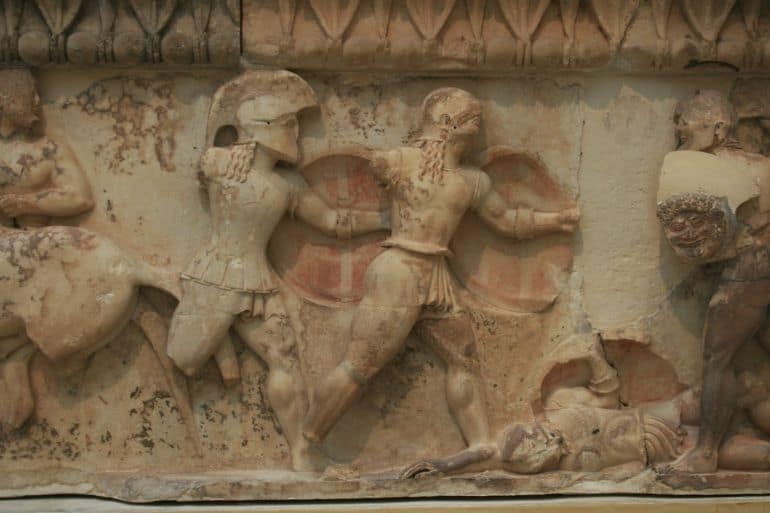 Despite their ‘laconic’ ways, symbolism and superstitions played a big role in the Spartan army. The ambit is quite evident from the way the Spartan kings sacrificed animals before the start of any military campaign beyond Sparta’s border. The fire from this sacrifice was then carried forth by a specially appointed fire-bearer or pyrphorus, all the way to the border. The flame was never extinguished as the fire-bearer accompanied the army on its march, and he was followed by a flock of shepherded animals. Among these animals, the katoiades (probably the she-goat) was chosen as the prime sacrificial victim dedicated to the goddess Artemis Agrotera. However, on the practical side of affairs, the flame was probably not snuffed out so that it could also serve as cooking fire for the army on the march while maintaining its symbolic resplendence. It was said the only time a Spartan warrior took a break from military training was during the war. However, the statement is not entirely true, since the Spartan army members were expected to exercise daily in both morning and evening sessions, even during ongoing campaigns. The only break they got from camp training was after the dinner when soldiers huddled together to sing their hymns. But even this ‘relaxing’ period was morphed into a competition when every man was then called forth to sing a composition by Tyrtaios. Then the polemarchoi (a senior military title holder) decided the winner and accorded him a choice piece of meat as the gift. The singing, however, was not just limited to the camp. Before the commencement of a battle, the king once again made sacrifices to the goddess Artemis. 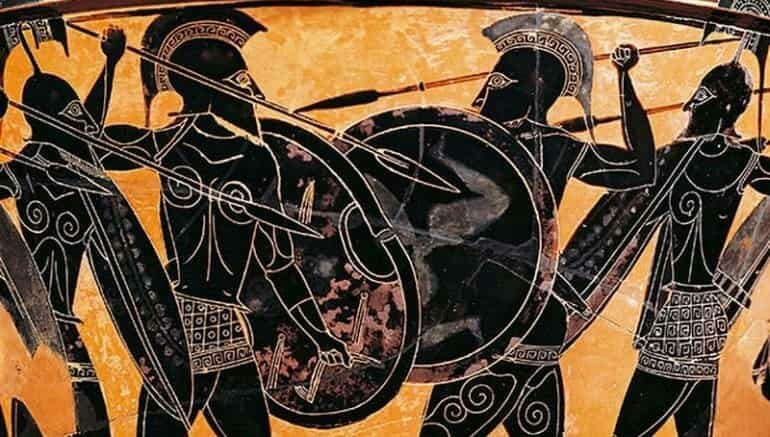 The Spartan army officers then grouped the hoplites and their lines started moving forward (with some wearing wreaths), while the king began to sing one of many marching-songs composed by Tyrtaios. He was complemented by pipers who played the familiar tune, thus serving as a powerful auditory accompaniment to the progressing Spartan army. Interestingly, as with many Greek customs, there might have been a practical side underneath this seemingly religious veneer. According to Thucydides, the songs and their tunes kept the marching line in order, which entailed a major battlefield tactic – since Greek warfare generally involved closing in with the enemy with a solid, unbroken line. 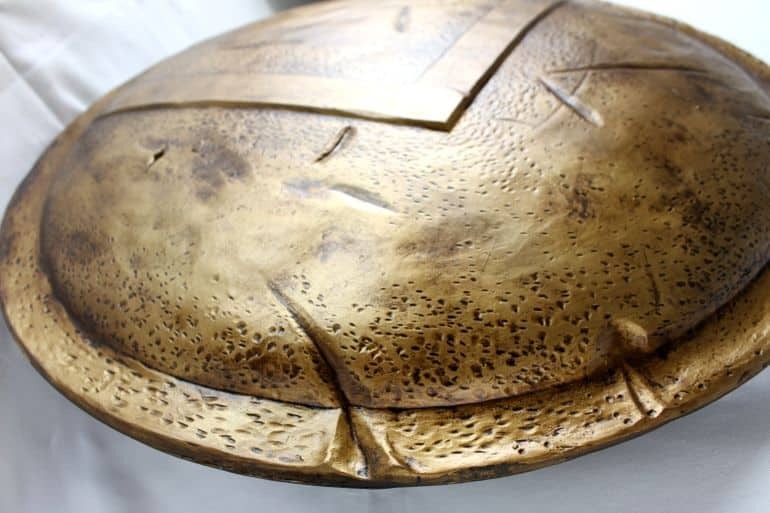 In the period after the 6th century BC, the hoplite shield or aspis (commonly referred to as the ‘hoplon’) went through a structural modification with the covering of the shield part with a layer of bronze. The supporting wooden (or leather) component underneath was also laminated, thus allowing for more curvature and strength. Suffice it to say, much like the Roman scutum, the aspis was used as a bashing weapon in close quarters – thus effectively making it an instrument of offense in spite of its core defensive credentials. According to Prof. Secunda, by late 5th century BC, Greek armies tended to discard their heavy body armors in favor of enhanced mobility. Interestingly enough, mirroring the very same period, the swords (known as xiphos) carried by the Spartan army got shorter – almost to a point that their length could be compared to daggers. This might have had its tactical benefit, with the short length forcing the Spartan warrior to thrust his weapon at the torso and groin areas of his opponent, as opposed to the conventionally longer Greek sword that was often used to slash at the head. 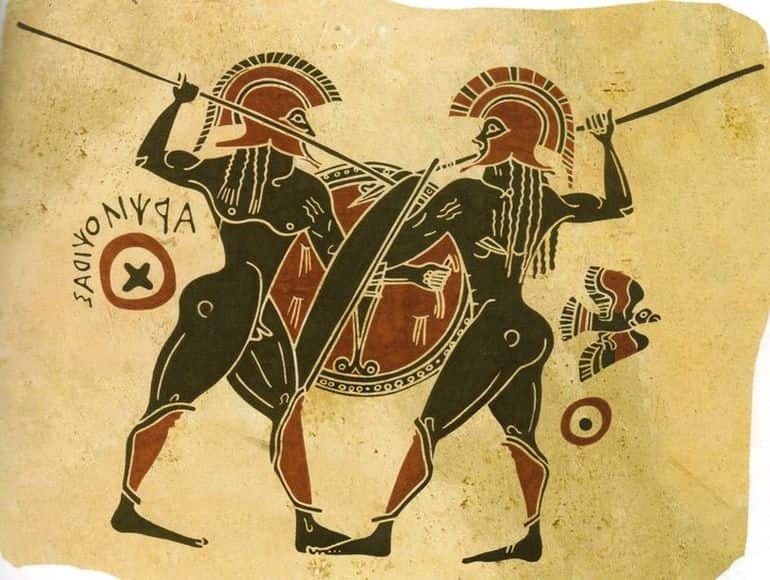 The advantage for the Spartans pertained to the fact that the contemporary body armors were also changed to lighter linothorax instead of the heavy ‘muscled’ cuirass – and thus a short sword could be used as an effective secondary weapon for inflicting thrusting injuries on the enemy. Given their penchant for close-quarters combat, it is not a big surprise that the art of archery took a backseat when it came to Spartan warfare. But beyond just avoiding any archery training, the Spartans actually abhorred archery as a skill. Plutarch once again provides numerous anecdotes, and one of them relates to how a Spartan warrior was mortally wounded by an enemy archer. While lying on the ground, he was not worried about his death, but rather remorseful that he would die at the hand of a ‘womanish’ archer. There were even incidences when the Spartan army simply refused to fight when they were at the receiving end of a determined archery barrage. One such episode related to an encounter in 425 BC, when an entire Spartan garrison surrendered after being afflicted by enemy arrows. One of the survivors was later mocked by his Athenian counterpart, who derided the soldier for surrendering and thus not showcasing the braveness expected of a Spartan warrior. The soldier replied that it was only a fine spindle (atrakon) that could distinguish the brave. The spindle, in this case, alluded to the instrument of a woman. 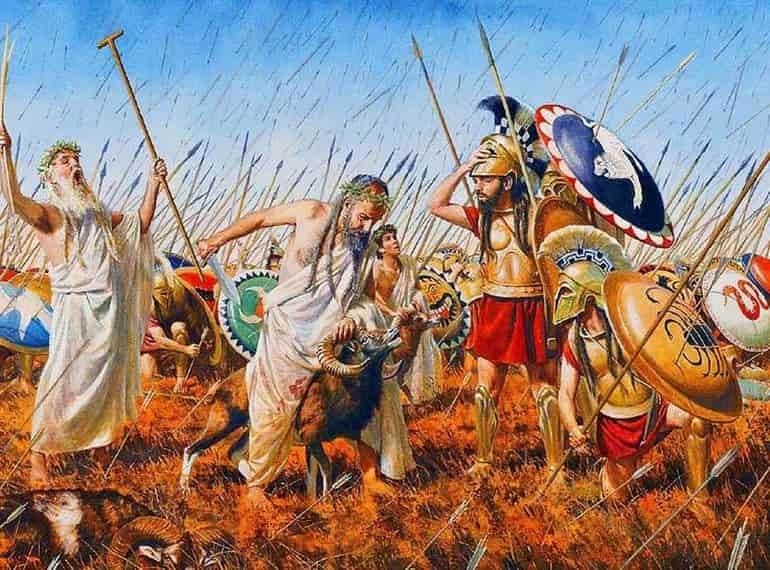 Nevertheless, the austere Spartan army was forced to adopt mixed tactics in the future that involved archers and other missile troops; but most of the archers were probably mercenaries employed from Crete. Given the Spartan propensity for warfare and nigh ‘egotistic’ bravery, it doesn’t really come as a surprise that cowardice was not accepted as a general rule. Even simple accusations of cowardice against a Spartan warrior could initiate government rulings that officially excluded him from holding any office inside the state of Sparta. And if cowardice was ‘proven’, the person was simply banned from making any kind of legal contract and agreement, which also entailed marriage. Furthermore, they were made to wear specially designed cloaks with multifarious colors and also had to shave half their beard. Such kinds of bitter episodes frequently led to suicides among the Spartan men who surrendered in battles (or ‘missed out’ on battles). In fact, Herodotus’ account of the Battle of Thermopylae attests to a similar behavioral pattern when two men were publicly shamed for not being part of the ‘heroic’ conflict. Unable to bear the pressure, one of them hanged himself shortly afterward, while the other redeemed himself by getting killed in a later encounter. The very term helot pertains to the subjugated population of both Laconia and Messenia, the two major territories controlled by the Spartan state. And while the Spartan citizens prided themselves on their warrior culture, they were not above recruiting helots or slaves during exceptional scenarios. 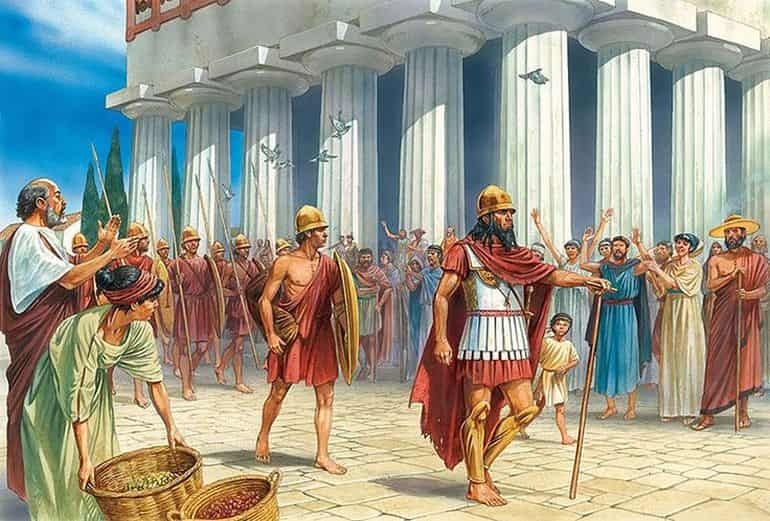 One such exceptional circumstance supposedly happened before the Plataea campaign, when the Spartan army might have recruited above 30,000 armed helots who would accompany their 10,000 citizen hoplites. These men were lightly armed and might have played supporting roles in the battlefield. 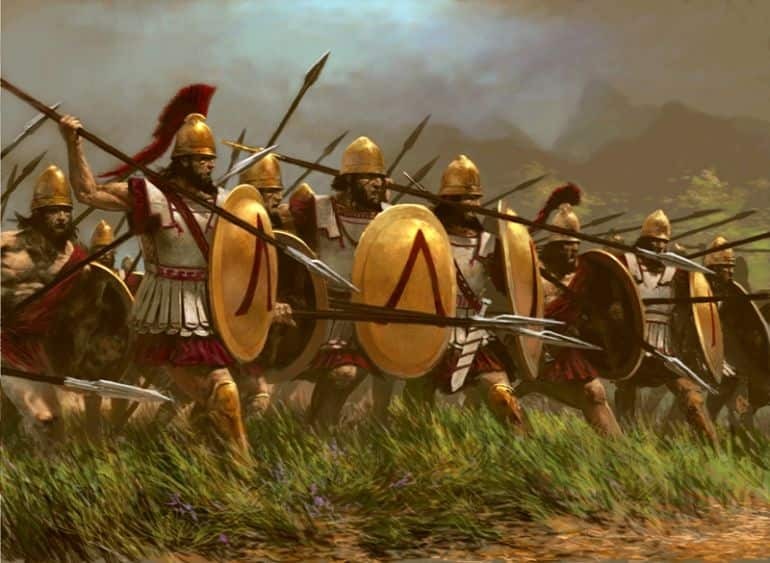 However, by the time of the Peloponnesian War, the Spartans actively recruited and trained helot hoplites. In fact, the first batch of the helot hoplites was even freed after they returned from their Thracian military campaign that took place over three years and ended in 421 BC. And meanwhile, the ‘home’ Spartan army was supplemented by neodamodeis or new citizens, another batch of better-trained helot hoplites. In the latter years, this trend continued on a periodic basis, with most of the neodamodeis given land along the border areas of the Spartan state. However the main reward probably related to their new found ‘freed’ status – a scope mirrored by the situation after the massive defeat at the Battle of Leuctra. During this chaotic time, the Spartans offered citizenship to any helot who volunteered for war service. According to Xenophon, more than 6,000 slaves joined the military in response. According to Xenophon, the crimson robes and bronze shields carried by the Spartans was mandated by their legendary law-giver Lycurgus. In that regard, Lycurgus apparently put forth his views that crimson of all colors was the least womanly, while bronze had the quality of tarnishing slowly (though it could be polished quickly). Plutarch interestingly added to this view by stating that the red-hued clothing might have psychologically afflicted the enemy while also hiding the bloody wounds of a Spartan warrior. 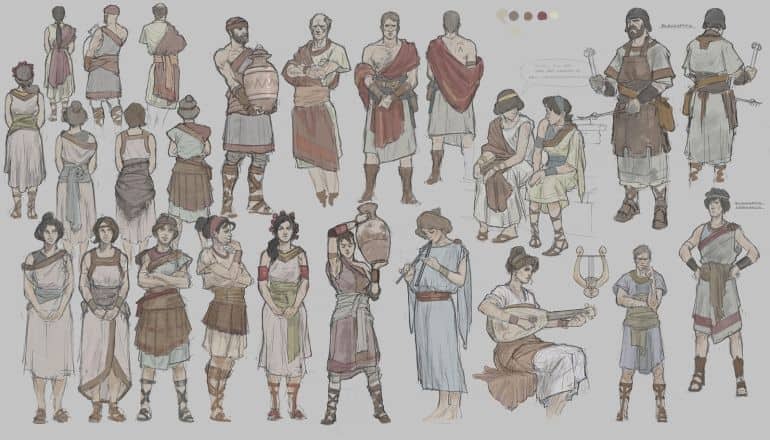 The latter explanation might have some justification since most Greek armies contemporary to even Xenophon’s time adopted some variants of the crimson clothing, probably inspired by their Spartan counterparts. On the other hand, beyond braveness and masculinity, there was possibly a more societal reasoning behind the preference of crimson clothing in the Spartan army. To that end, crimson was generally considered as an expensive dye. 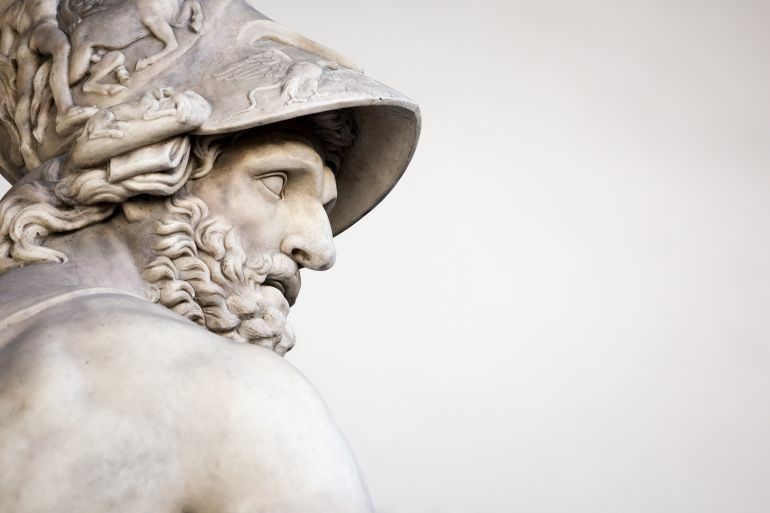 Xenophon also talked about how soldiers should be dressed at their best in a battle, in case the Gods granted them to victory (and the troops, in turn, could mark the occasion in an opulent manner, or die in a regal manner). So the Spartan mothers and wives proudly made the battle tunics of their sons and husbands with the finest possible materials. This societal tendency later transformed into a norm by 4th century BC, and thus the Spartan army became uniformly draped in crimson robes. Earlier in the post, we mentioned how the meirakion or youth was forced cut his hair short while training in the agoge. 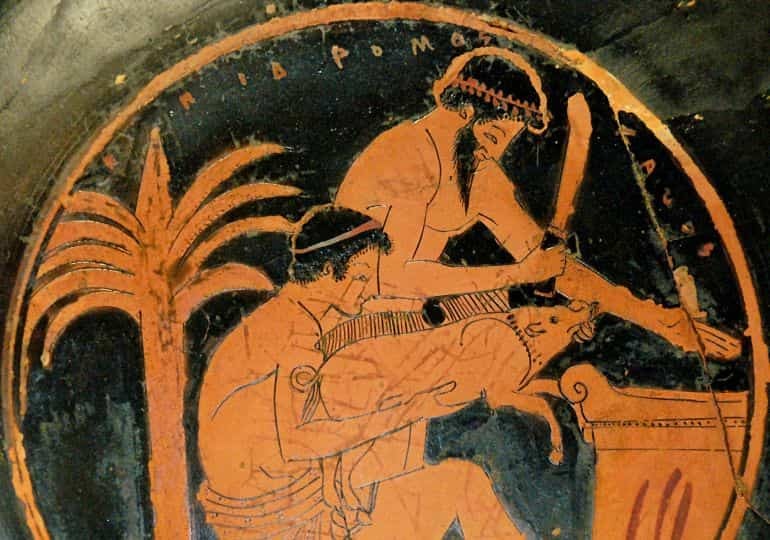 But as Prof. Secunda noted, according to Xenophon, once the Spartan male entered manhood (possibly, at the age of 21), he was allowed (and sometimes even encouraged) to grow and wear his hair long. This notion once again had a social bearing, with the elders believing that long hair made the person seem taller in stature, and thus more dignified as a Spartan warrior in the battlefield. And according to Plutarch, long hair made the good-looking men more handsome and the ugly-looking men more terrifying – both of which had their psychological value in the Spartan army. And even beyond vanity, long hair had always been associated with freedom in Archaic Lakedaimonian circles – since many servile tasks couldn’t be achieved by keeping one’s hair long.